The closest town (shopping area) to us is called Mamali and its about a 15 minute drive. We go there when we need to get more food or other necessities. Here's a shot of the inside of one of the markets, it stunk so bad in there- probably because of the rotting fish they have laying around LOL! 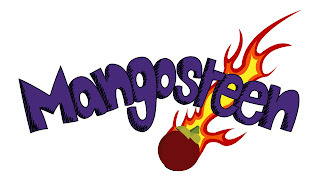 My favorite fruit is Mangosteen! (which also happens to be the name of my girlfriend Heather's sports team at Southern :-) Here's what one looks like. Yay! I like the beefed up version. They should have used that for the t-shirts!